This lesson provides a description of how to provide rationale for why the IEP Team has determined the student is not eligible for special education services. This lesson also requires that you have added an invitation, indicated parental/participant attendance, and indicated that the student is not eligible for special education services. For more information on how to add an invitation and participant information see the, "Create an IEP Invitation" chapter in this manual. For more information on how to input parental/participant attendance and determine eligibility see the, "Complete Ineligible IEP" chapter in this manual. 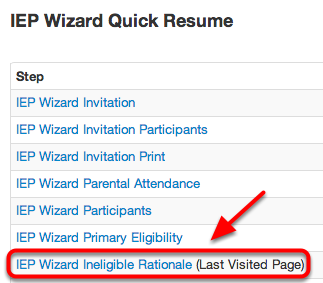 From the IEP Wizard Quick Resume Menu, select IEP Wizard Ineligible Rationale. 1. Enter rationale for the IEP team's decision in the Ineligible Rationale field. 2. Click Save or Next. Clicking Save or Next will automatically take you to the Notice/Provision of Services page. For more information on how to complete the Notice page see the, "Determine Provision of Services" lesson in this manual.